As I’ve mentioned before, weekend brunch is pretty important to us. It signifies a lazy morning where we don’t have to rush off to school or work. It’s a time to enjoy each others company and eat something delicious and hearty. This recipe has been a family favourite for many years. 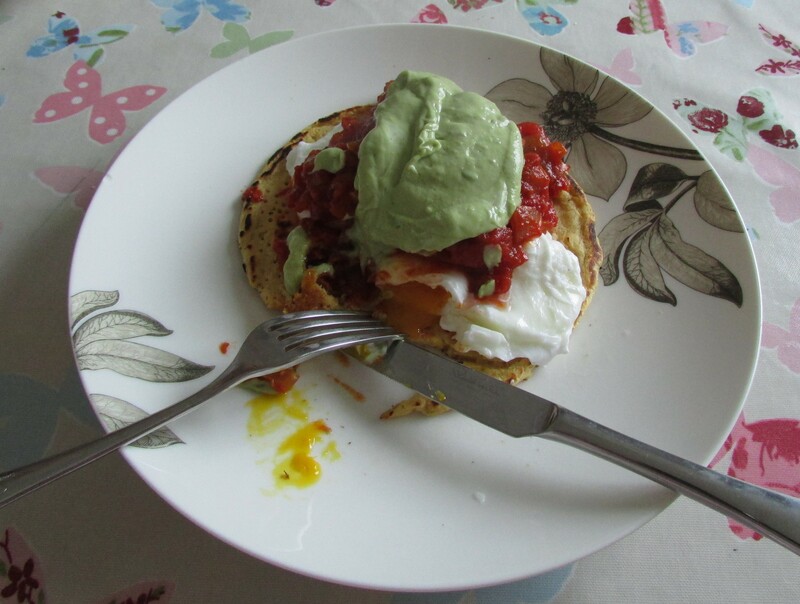 It incorporates some of my favourite flavours – spicy tomato, cool avocado and runny farm eggs (now sourced from Headington Farmers Market). Corn tortillas are made with masa harina, finely ground cornmeal – which can be picked up from any Asian supermarket for about £1.20 a kilo. Tortillas are very quick and simple to make, and are a great accompaniment to any Mexican dish. They can also be deep fried to make tortilla chips. Cornmeal is very high in potassium, magnesium and B6, with one corn tortilla providing about 8% of your RDA for these vitamins. Coupled with farm eggs and avocado and this becomes a very nutritious breakfast. In a medium bowl, mix together 1 cup of corn flour and 1/2 a cup of hot water until thoroughly combined. Turn the dough onto a clean surface and knead until pliable and smooth. If the dough is too sticky, add more flour; if it begins to dry out, sprinkle with water. Then cover the dough tightly with plastic wrap and allow to stand for 30 minutes. Preheat a cast iron skillet or griddle to medium-high. Divide the dough into 8 equal-size balls. Using a rolling pin, or your hands, press each ball of dough flat between two sheets of plastic wrap. Immediately place a tortilla into a preheated pan and allow to cook for approximately 30 seconds, or until browned and slightly puffy. Turn the tortilla over to brown on the other side for approximately 30 seconds more, then transfer to a plate. Repeat the process with each ball of dough. When cooked, do keep the tortillas covered with a tea towel to stay warm and moist until ready to serve. In the meantime, finely slice an onion and 1 clove of garlic and fry in a little olive oil until brown. Add 1 tin of tomatoes and 1 or 2 dried red chilli’s depending on how hot you like it and allow to simmer until it reduces and infuses (about 5-10 minutes), season with salt and pepper. In the last couple of minutes poach some eggs and blend an avocado. Assemble together and enjoy. Tip to keep the budget low – many grocers will sell avocados cheaply when they are over ripe – which is perfect for making guacamole. Any leftover cheese that needs using up is delicious grated on top. This entry was posted in Budget Breakfasts, Frugal family recipes on January 17, 2015 by carolinementzer.